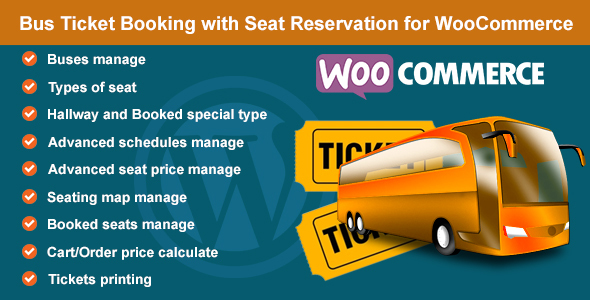 The excellent plugin allows managing the seat reservation system for bus ticket booking with WooCommerce. This is a special version for bus, but you can also use for cinema, train, airplane, event, theater, movie theater, beach chair etc, it is an enhanced version of Advance Seat Reservation Management for WooCommerce. Admin can create Profiles for buses, each profile, admin can create types of seat like Available, Booked, VIP, Standard etc. There special type is “Booked Seat” to block seats when the seats was purchased or if you want disable some seats, and “is Hallway” type if you want it’s hallway or a space. Admin also can pick a color or upload an image icon for the seat. 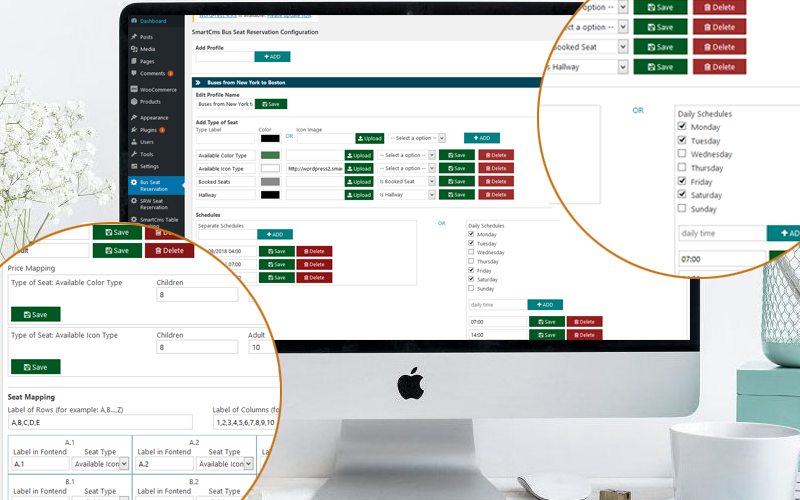 Admin can create separate schedules by date picker or create daily schedule by days of week and daily time. Admin can create type of price on a seat like Children, Adult, Student etc and setting price for each types. Admin can create seat mapping by enter label of rows, columns, and then choose type of seat and enter label for each seats. In Woocommerce product, admin will choose a Profile for that product, booked seats will be manage here. In frontend product page, customer will can see types of seat and corresponding price. They can choose a schedule and an option, then choose their seats and add product to cart. On the cart page, the seats price will be calculate base on type of seat and option. When customer complete order, the booked seats will show, admin can see these seats in product edit page and order detail page in backend. In orders listing page admin can print the tickets with base information. Very easy and flexible to install and configure, you will have an excellent bus ticket booking management system. Quick and simple, the plugin will really useful for your website.